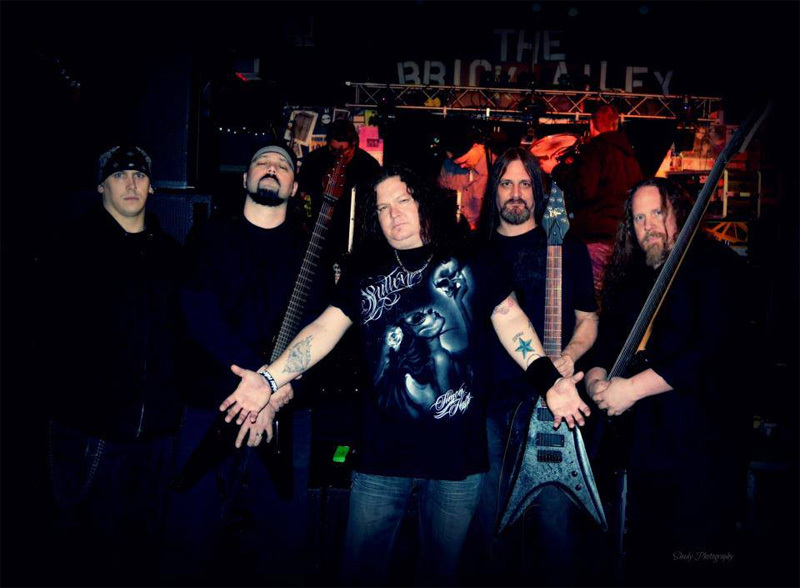 Seven years removed from their last album, Akron Ohio's Shatter Messiah makes their return with a new album, Hail The New Cross on a new label, and a revamped line up. 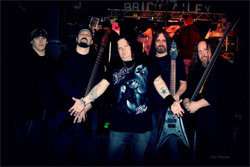 Founders guitarist Curran Murphy (Annihilator, Nevermore, et al) and drummer Robert Falzano (also Annihilator) remain, adding new vocalist Mike Duncan (POWND), Pat Gibson on guitar, and Jim Lewis on bass. Shatter Messiah: so happy together. 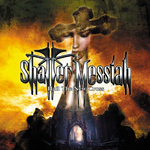 What hasn't changed is Shatter Messiah's allegiance to classic heavy and power metal led by Murphy's skillful and brisk guitar work. Actually, the one thing that grabs you from start to finish is the abundance of riffage, a freakin' wall of metal guitar slammage. After that, it's likely the pace of the music, most songs rushing along like an Amtrak train with the Coyote's Acme rocket strapped to the engine. Mercenary Machine can be quite blistering. Alternatively, SM can mix it up enough to vary the tempo in a song like with How Deep The Scar. (Excellent drumming on that one too.) Or simply be more steady, moderate, as with Memory Flames. But this is where Shatter Messiah could trip you up. Variations in tempo isn't necessarily the sine qua non of progressive metal. Yet listening to the aforementioned How Deep The Scar, or moments within Gods of Divinity or This Addiction, Shatter Messiah could easily make the leap to prog metal; certainly, Murphy has the chops to do so. The only thing that fans may quibble with is the brevity of the album, eight songs under 40 minutes; most bands these days are pushing the 50 minute or more envelope. Nevertheless, less is more when you have a fine return to form for Shatter Messiah with Hail The New Cross. Recommended. Hail The New Cross is a fine return to form for Ohio's Shatter Messiah, an album with sorties of ballistic heavy metal riffage.